Areas of patchy fog early. Cloudy skies. High 77F. Winds E at 5 to 10 mph. LAREDO–In 2010, State Representative Richard Peña Raymond (D-Laredo), Congressman Henry Cuellar (D-TX), Sheriff Martin Cuellar and Department of Public Safety officials among them Department of Public Safety Deputy Assistant Director of Crime Laboratories, D. Pat Johnson discussed the need to implement a Laredo Crime Lab to assist law enforcement agencies with the expertise of forensic specialists in order to submit and expedite evidence. The meeting resulted in the approval by the 81st Texas Legislature to appropriate $6.1 Million Dollars for the state of the art facility and has allowed for construction to begin this year. “I understood Sheriff Cuellar’s request loud and clear when we first met and it was imperative that I share our city’s concerns with DPS and the Legislature to further assist our law enforcement agents. By incorporating crime lab scientific techniques in our area, a growing city such as Laredo will benefit greatly from the intelligence and technical assistance this crime lab will provide to support our agents and expedite all criminal investigations,” said Rep. Raymond. 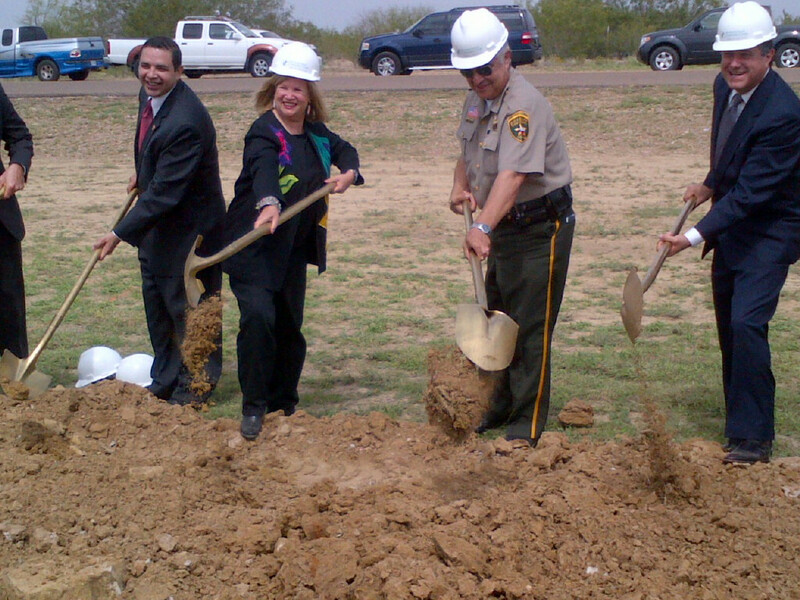 Congressman Henry Cuellar, DPS Commissioner Cindy Leon, Sheriff Martin Cuellar and Rep. Richard Peña Raymond break ground on the new DPS crime lab. The 81st Legislature appropriated an additional $350,000 in equipment costs for the new Laredo DPS crime lab which will be 17,143 square feet when finished. Completion is projected to be in September 2013. Initial staffing level is to be 10 lab employees with room to increase to 15 employees. Services offered in the Laredo lab will be controlled substance analysis, firearms/tool mark examinations and serology/DNA analysis, all provided at no cost to law enforcement agencies. “When taking this office we looked at the needs of this community and noticed a need for servicing our partners in law enforcement. So our vision was to make a difference in organizing and preparing for the future. Among the many plans we included a much needed crime lab. It goes without saying that we, at the Webb County Sheriff’s Office, are extremely excited to welcome this new addition for our law enforcement community. It is not only the law enforcement community that benefits, but also the citizens of Webb County and surrounding areas. This crime lab will contain state of the art equipment and trained personnel that will be available in our community. Once in operation, it will enhance and expedite investigations and it will also assist with expediting court cases within our judicial system,” stated Sheriff Martin Cuellar. Congressman Henry Cuellar announced $250,000 in federal funds he was able to secure that will be used for the new extended DPS Crime lab in equipment. Provided through an earmark obtained in the last legislative session to the Webb County SO Martin Cuellar the funds were specifically targeted to equip a firearms testing range and a freezer to store DNA evidence. This Laredo Lab will be the 13th Lab to be established by the Department of Public Safety, the other 12 are spread throughout the state. Law enforcement officers served by the Laredo crime lab will no longer have to submit evidence for these services to existing labs located 100-150 miles from Laredo.